Those days are gone when we used to think about what course we should choose for making our future bright. But now this problem has been sorted out due to engineering degree. It has become the best solution which holds the answers for all the queries related to our future. 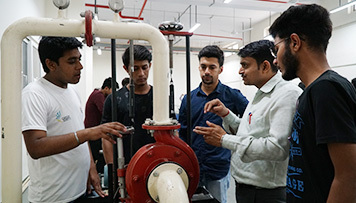 In the present time, one of the best options for choose Best Engineering Institute in India which gives us various options for our career in mechanical, electrical, Electronics, Civil, Computer, Information Technology and Biotechnology but other courses offered limited career options. Graduates after completing management course, can grab managerial jobs in banking and other multinational companies in India as well as in abroad. Before selecting any course one should focus on feasibility of the course and employ ability of the course as well. An engineering degree makes the student capable to crack the civil services exams including Indian Foreign Services, Indian Administrative Services and Indian Revenue Services. In short, there are many options to choose in engineering field including- Civil Engineering, Electrical Engineering, Mechanical engineering, Electronics Engineering, Biotechnology, etc. One of the most important factors while choosing the course is the selection of choosing right college from where you will complete this course. Because Degree from a well reputed college can lead you to the height. Many reputed or multinational organizations recruit candidates from well recognized colleges. There are a number of best engineering institute in India you can choose as per your suitability and SRM is the best engineering Institute in India among them. Selection of best Engineering course and Institute can fulfill your dream and will take you to the first step of ladder of your dream. While choosing the best institute many factors needs to take in consideration which includes air conditioned classrooms, well equipped labs and world class faculty which leads to excellent quality education. And it should be centrally located in the city. By keeping these points in mind, SRM Institute can be considered as top of the institutes which fulfills all these requirements. Its world class infrastructure and highly qualified teachers leads high quality education. It is well known for its quality rating teaching and advanced research. It is well connected to roads and railway as well. The SRM Group has been in the field of education of engineering since 1969. Since then it has taken engineering courses to success of the height. The Library of SRM University provides comprehensive access to journals, books, surveys, reports covering diverse disciplines. SRM Group has been acclaimed as one of the best university in India with over 20,000 students and 1,500 faculties.